Ledge type falls, about as wide as it is high in normal conditions. they fall into a deep pool with gravel bars all around. French Broad Falls is at the left part of a semi-circular rock ledge; on the right side of that ledge, next to an old mill, is Shoal Creek Falls. 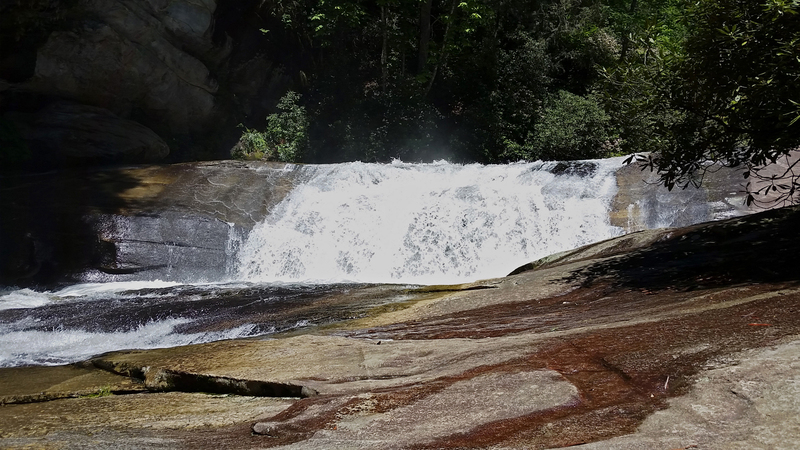 Walking downstream will lead to cascades and Bird Creek Falls (aka Cathedral Falls). Driving Directions From the intersection of NC Hwy. 215 and US Hwy. 64 near Rosman, follow NC 215 North about 7 1/2 miles. Look for the parking pull off on the left – it’s just past Round House Drive (private) and there are some boulders placed at the trailhead. Keep in mind that this is private property and the owners graciously have allowed the public to visit.